Wait, what did I study again? Yes, you are still on the blog representing the master programme of animal science, haha. 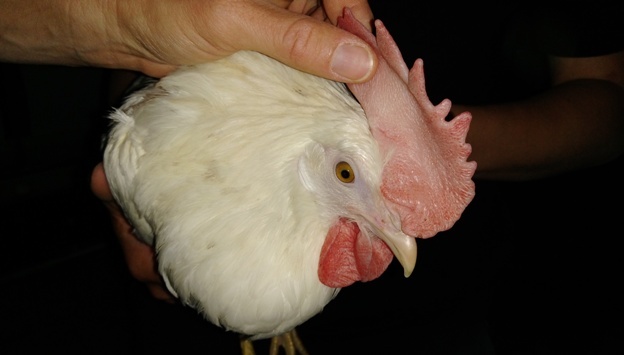 You may have read that I have been busy with preparing a preference test for chickens. Well, this is a big part of the preparations – the practical part – so to say. As the two sections of our testing pen should be as identical as possible, I am constructing smaller perches of which two should fit into one pen, instead of one large perch. 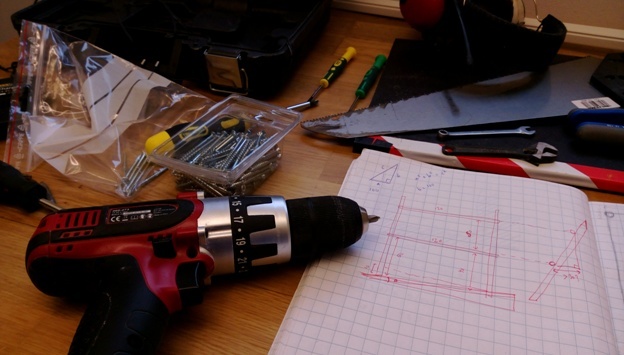 After measuring, drawing and calculating, I’ve been spending many hours at the research facility sawing, drilling and hammering. Who would have thought this would be included in your masters degree? Not me! But I enjoy these kind of things a lot, and it’s a welcome change to sitting in class. Hopefully the chicken will be content with my handicrafts! 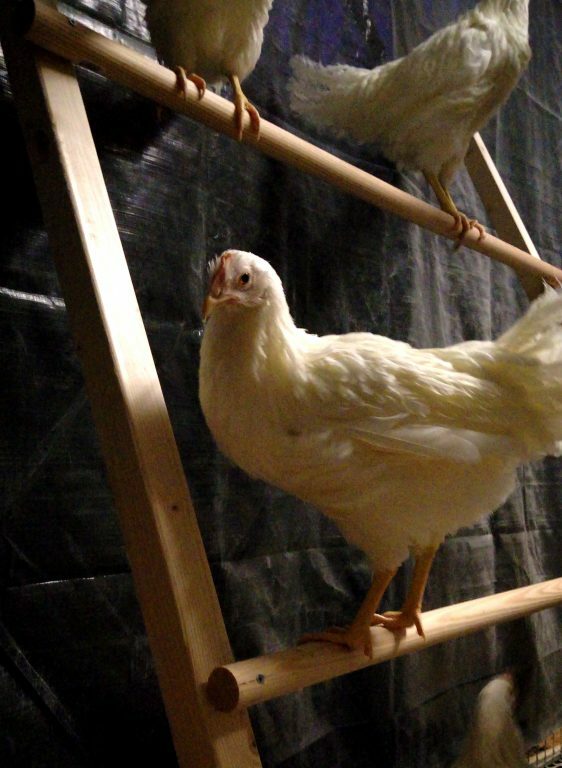 On the left part of my messy work desk, on the right chickens testing my first prototype perch. Any questions? Suggestions? Want to volunteer building perches? You’re always welcome to leave a reply. 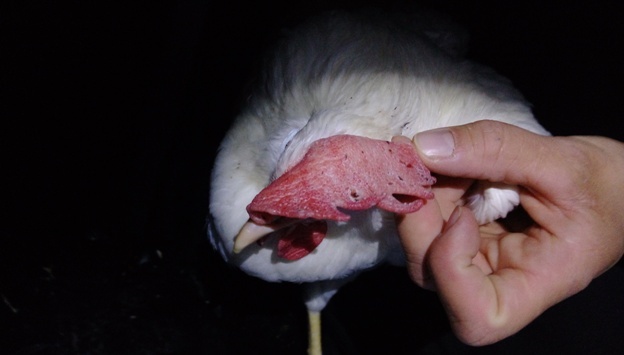 Since a few months I have been doing behavioural observations of the chickens as part of my degree project. However, soon I will start with the second part of this research project as well; the preference test. The idea is not to difficult to understand. A certain space is divided into two or multiple areas with one same variable that is different for each section. Then the animals are put in the space with the ability to roam around freely, and their locations and behaviours are scored. 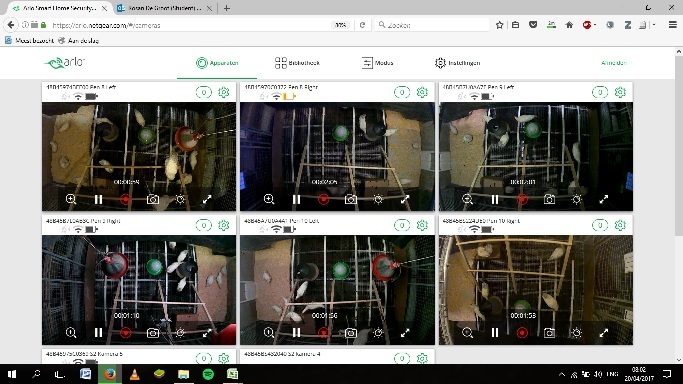 In the end you can see if the animals seem to prefer one section over another or whether their behaviour is different in one of the sections. To not have any bias of the results, the different sections should be as identical as possible. 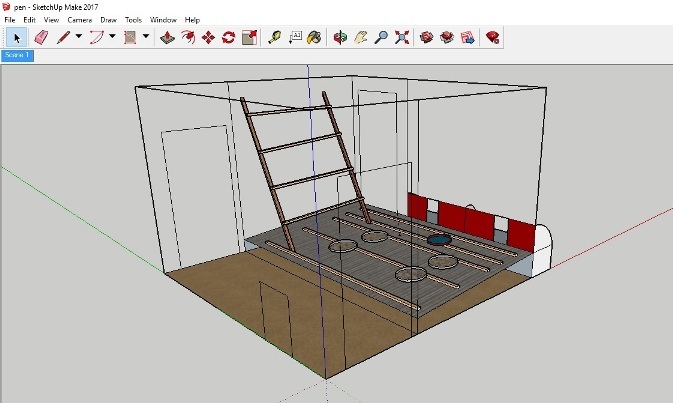 Simplified model of the current chicken pens made using Google SketchUp Make, on scale. Last week our housing course came to and end. Our final exam was an essay type home-exam. I’ve written before about the variety of examination types here at SLU. I still found it a bit hard to prepare for such an exam, as it’s not a method I am used to. However, I think the exam touched upon all aspects of the course and must have given a good overview of our obtained skills. The housing course included a lot of physics and engineering, therefore I think that this type of exam was perhaps more useful than a traditional exam. The calculations were rather challenging, but let’s hope for the best. Now it’s time for the course evaluation. After each course there is usually a moment of evaluation both in class, as well as online. SLU puts a lot of emphasis on these evaluations, as they are of use to improve the quality of education. This time I have volunteered to be the course representative, which will be my first time. The course representative plays an important role in the course evaluation. As a representative you are supposed to discuss with your classmates about possible improvements, but also to scan through the evaluations and highlight the most important suggestions. The final summary will be discussed with the course leader and hopefully lead to future improvements. The grade out of the scoring by the students will become available on the SLU studentweb. When you are looking into which courses to pick for the next semester, you can find these scores of the courses from previous years, which may be helpful to make a decision. Do you have any more questions about the examination or course evaluation? You’re always welcome to comment or leave a question in a reply below. There is one more excursion from the animal housing course I’d like to tell you more about. 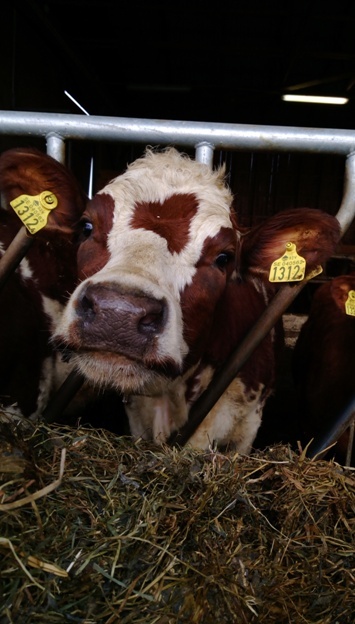 The same day as visiting the active horse stable, we went to see an organic dairy farm. As we had already been looking at a couple of dairy stables, such as the modern loose housing and the traditional tie stalls at Jälla an the very large facility at Lövsta, we could make some comparisons. Plus, this was the first organic system we were going to see since the course had started. The farm is operated according to the standards of KRAV, which I explained something about in the previous post about our project work. After we had changed into our protective wear we were warmly welcomed by the dairy farmer. He explained a bit about his farm before giving us a guided tour over his premises. He showed us his milking robot, the main herd, young stock, calves and pregnant cows. We had a closer look at his manure management and the types of flooring he used. There were generally large differences between the buildings but all of them were naturally ventilated. Which I think was quite fascinating seen the cold Scandinavian climate, but his Swedish red cows seemed to cope well with it. After the tour we had the possibility to go and look around a bit more for ourselves. 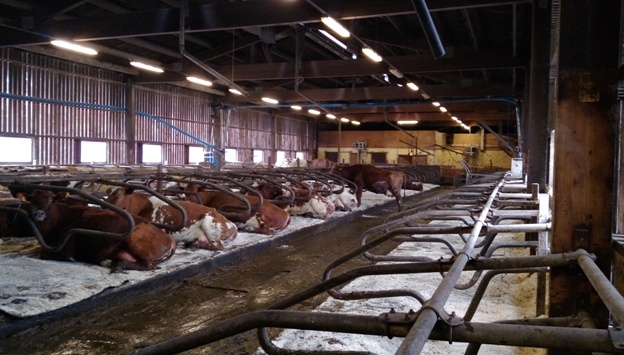 The indoor housing of organic and conventional dairy cows is not that different. I’d say that the biggest differences concern the feed and pasture management, though in Sweden grazing is obligatory for conventional dairy as well. We were lucky to see a calf that had just been born, being licked dry by her mother. We asked the farmer for how long calves are required to be with their mothers, and he explained that it should be at least for 24 hours. He also told us that it used to be longer, but that KRAV has changed this quite recently in their standard. He expressed how pleased he is with this, since in his experience it is less stressful for the mother and calf to be separated after 24 hours than after three days. This information resulted spontaneously in a very interesting discussion about the different rules and experiences concerning calf weaning between the students from our class. It’s a hot topic in many countries at the moment and the opinions on it vary strongly. Before we went back to the bus we continued to talk for a little while with the farmer. I was curious about what he’d like to improve most and he told me that he’d like to change the housing for the calves. Right now part of the calves are housed in what used to be a tie-stall stable and the ventilation is not optimal. He had noted that the calves in this building perform less well than his calves in the outdoor iglos. A direct example of the interaction between animal and environment. Our course leader, Stefan Gunnarsson, was wondering what the farmer would like to see from us in our future career as ‘potential farm designers and advisors’. He answered: “Beautiful buildings, easy to work in and should be good for the animals too. Simple.” However, he took me by surprise when he continued about durability. He wondered if we were making buildings maybe too durable? He explained that the materials we use now, result in farm buildings that can live for up to perhaps a hundred years. But after about twenty years a building is maybe not ‘so modern anymore’, and might not fulfil the latest requirements. This results in empty farm buildings – a waste according to the farmer. Should we build for less durability? Some food for thought. Any thoughts on this topic, or some quiestions? Feel free to reply below. With the final exam coming up this Monday the housing course is soon coming to an end. It’s feels like it was yesterday when we started! Last week was fully dedicated to our project-work and the presentations of it. We have been working for several weeks in small groups on the task to plan and design a farm building. As each group had been given a different animal species to work with, the results were very diverse. This made it quite exciting to see all the presentations, since everybody had been facing different challenges. The project-work was focused on following the Swedish guidelines, but paid attention to the international perspective as well. Our group had the task to design a housing facility for laying hens. We were given the choice between conventional farming or organic, and we chose the latter. 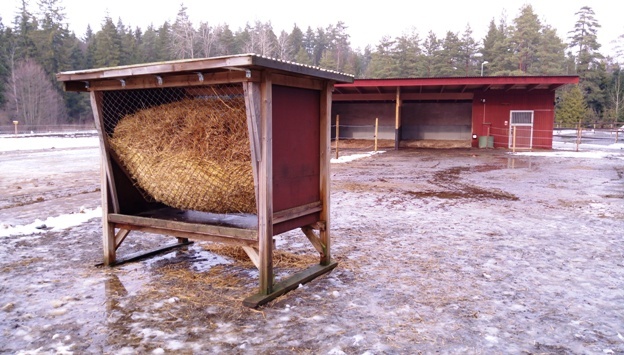 In Sweden most of the organic farming is according to the standards of KRAV, which often has additional requirements concerning animal welfare and environment than the EU organic standard. As we were curious to these differences we chose to plan our farm as if it were going to be KRAV certified. Surprisingly, we found that for laying hens the differences between KRAV and EU organic are not as big as for example in pig production. What is a horse, really? I don’t mean to find an answer to a description of what a horse looks like, I mean, we all know that it has four legs, a head, mane and tail. But think again. What makes a horse, a horse? What does a horse do? Let’s look at a horse in a natural environment: Were you aware that a horse is a grazing animal, spending roughly about 16 hours a day browsing for food? 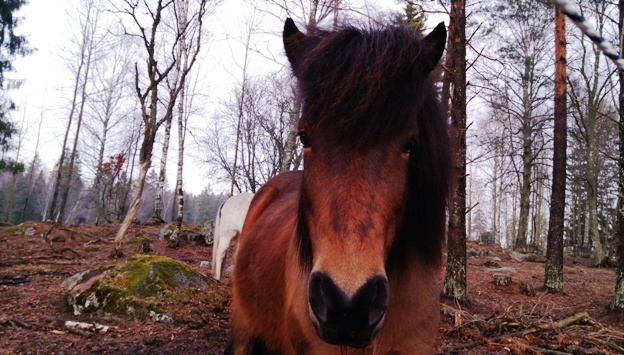 Or did you know that horses are highly social animals, living their whole life in dynamic herds? Have you thought about the amount of time a wild horse spends moving around? Keep those thoughts in mind. Now let’s imagine the average horse stable. What do you see? Most likely, individual boxes. What do they offer? Social isolation, no space to roam around and limited feed supply. Now tell me, how come that modern horse owners still believe this is a good solution? Yes, I believe horse owners have the best intentions at heart, spending hours a week to muck out stables, cleaning water buckets and spending large amounts of money on the latest concentrates. However, I do not think that this way of horse keeping is ideal in terms of horse health and welfare or human labour and ergonomics. Luckily, I am not alone in this. Innovative designs for more natural ways of horse keeping are increasing in popularity throughout Europe. Last week the housing course arranged an excursion to one of these stables making use of a design that is adapted specifically towards the horse’s needs. This one was a so called ‘active stable’. I must admit, I have seen and experienced many different horse stables in my life, but never was I as much impressed as with this one. Marma Torp is a small scale horse facility that houses Icelandic horses exclusively. 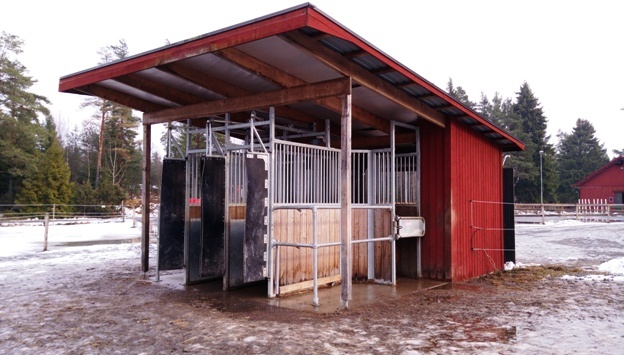 Their philosophy is that loose-housing of horses fulfils both the physical and psychological needs in a better way compared to stabled housing. Besides, they are convinced that a modern active stable is not advantageous for the horses only, the people benefit as well. For example this way of horse keeping demands relatively little labour and seems not more expensive than traditional housing in the long run. 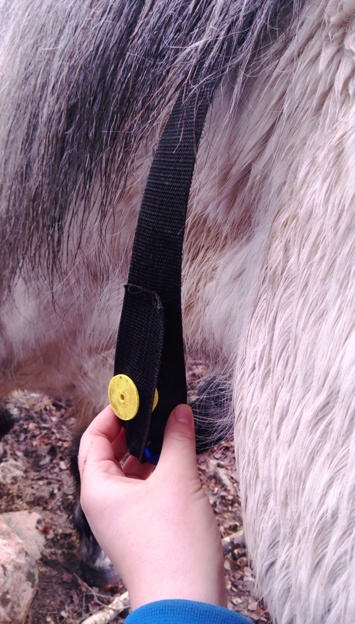 All the horses wear a collar which includes a chip that gives them access to the feed stations. In this way, the horse chooses itself when it would like to eat, and how often. Although the total amount is managed by the people through a computer system. When the horse enters the feeding station the doors behind the horse close, so that no other horse can enter at the same time. When the doors are closed the feed will become available, as the partial door towards the feed is lowered. After a set time the door towards the feed rises again, meaning feeding time is finished. The horse leaves the feeding station and can come back at a later time. In this way the horse is able to eat small portions of roughage throughout the day, without any human labour involved. The bales of hay are moved into the feed station mechanically. The area where the horses walk around freely consists of a gravel paddock, a small forestry area and grassland. Besides the feed station, a heatable water tub, a wind shelter, unlimited straw provision and a spacious group stable are provided. The whole area is divided into two, to provide a separate mare and gelding herd. The current facility is able to house up to 14 Icelandic horses. We had a critical look at the body condition of the horses. Icelandic horses have a reputation to put on weight easily, but these were all in excellent condition. Impressive, but not surprising, if you consider their smart management. The hay quality is analysed, individual eating time per horse measured and those data together provide the formula for how many hours a day each horse may spend in the feed station. It was really inspiring to listen to and talk with the owners of the place. They are very enthusiastic about the system, even though they had to make several changes from the start. Is it perfect? Almost, if you ask me. For example you could see that some cheeky horses managed to steal from another’s hay. Also, I do think there are still some challenges left when looking at sustainability aspects. Could the manure be collected from the forest area to prevent from phosphorus leaking and be of use elsewhere? What is the energy source behind the feed stations, could solar panels be placed on the roof? These days Sweden counts about thirty active stables. I don’t want to say that this system will be the solution for everyone, but I think it is a beautiful example of alternative horse housing. It would already be a great step forward to rethink the way we choose to house our horses. Why not look at the opportunities for small changes in our current housing systems towards a more horse-friendly environment as a start. 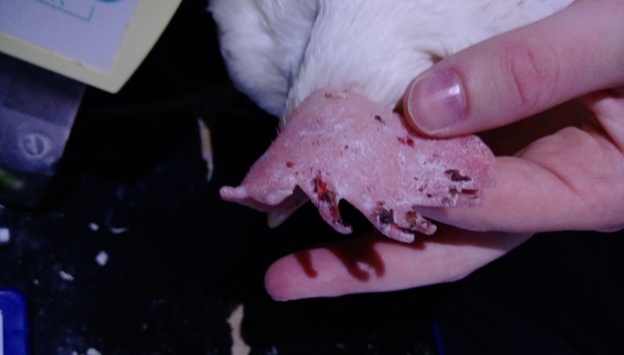 To me, in ‘horseworld’ many things seem to happen because ‘it has alwas been done like this’. Let’s be innovative instead and learn more from each other’s experiences. Any questions? Comments? Opinions perhaps? Feel free to reply below.